Yurts have become popular out door living spaces with a range of uses including homes, class rooms, studios and camping. Coppiced ash and willow is often a favorite choice for the numerous poles needed to construct the walls and roofs of yurts. The component parts are either cleaved and worked and crafted on the shave horse or sawn timber can be used. 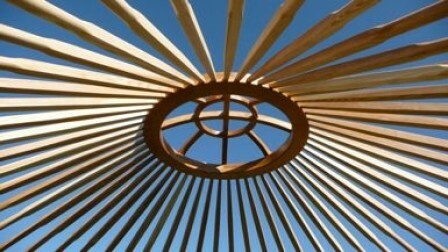 The crown and roof poles are often steam bent to produce the familiar yurt shape.